The history of Old Fort Niagara spans more than 300 years. During the colonial wars in North America, a fort at the mouth of the Niagara River was vital, for it controlled access to the Great Lakes and the westward route to the heartland of the continent. With the completion of the Erie Canal in 1825, however, the strategic value of Fort Niagara diminished. It nonetheless remained an active military post well into the 20th century. The three flags flown daily above the parade ground symbolize the nations which have held Fort Niagara. 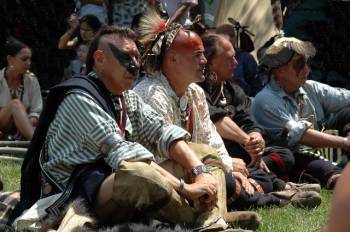 Each competed for the support of a fouth nation: the powerful Iroquois Confederacy. The French established the first post here, Fort Conti, in 1679. 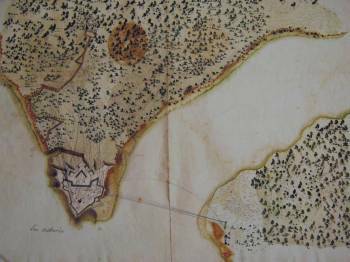 Its successor, Fort Denonville (1687-88) was equally short lived. In 1726 France finally erected a permanent fortification with the construction of the impressive "French Castle." Britain gained control of Fort Niagara in 1759, during the French & Indian War, after a nineteen-day seige. The British held the post throughout the American Revolution but were forced, by treaty, to yield it to the United States in 1796. Fort Niagara was recaptured by the British in 1813. It was ceded to the United States a second time in 1815 at the end of the War of 1812. This was Fort Niagara's last armed conflict, and it thereafter served as a peaceful border post. The garrison expanded beyond the walls following the Civil War. Fort Niagara was a barracks and training station for American soldiers throughout both World Wars. The last army units were withdrawn in 1963. Today, the U.S. Coast Guard represents the only military presence on the site. Old Fort Niagara was restored between 1926 and 1934. It is operated today by the Old Fort Niagara Association, Inc., a not-for-profit organization, in cooperation with the New York State Office of Parks, Recreation and Historic Preservation. Admission fees, Museum Shop sales, grants, and donations provide support for the operation of the site. Membership in the Old Fort Niagara Association is open to all. The importance of the Fort Niagara site was created by geography. The Great Lakes and their connecting straits form a continuous body of water from the Atlantic Ocean to the center of the North American continent. Along the southern and western edge of the lakes lie continental divides which separate the tributary streams of the Great Lakes from those draining into the Gulf of Mexico. To Native Americans and early Europeans, these waters provided natural highways through a rugged and heavily forested land. At the eastern end of Lake Erie, the vast fresh water drainage of the Great Lakes is constricted into the Niagara River. From that point until its junction with Lake Ontario, some thirty miles to the north, the Niagara River drops four hundred feet in elevation. Most spectacular is the 182-foot plunge over Niagara Falls. The cataract, with its gorge and rapids, creates the single greatest impediment to waterborne traffic in the Great Lakes. The importance of this water highway and the portage necessitated by the falls ensured that the Niagara River would become a point of contention between the nations attempting to dominate North America. While French, British and Dutch colonists all settled on the shores of North America at about the same time, the French were best situated to exploit the natural routes to the interior. Despite some troublesome rapids, the St. Lawrence River led directly from their settlements to Lake Ontario. The French were thus the first Europeans to attempt to control the Niagara Portage. This was not an easy goal. Located astride Lake Ontario and the portage was the Five Nations of the Iroquois, militarily and politically the most powerful group of native people in American history. The French had alienated the Iroquois by aligning with their ancestral enemies. Although moderated for short periods of time, animosity between the Iroquois and the French would never entirely disappear. The French thus found a powerful human obstacle to their use of the Niagara. Warfare between the French and the Iroquois was bitter but sporadic throughout the seventeenth century. During the 1670s, however, relations improved to the point where the explorer and trader Rene Cavelier, Sieur de LaSalle was able to obtain permission from the Iroquois to use the Niagara Portage. He wished to construct a sailing vessel above Niagara Falls for use on the Upper Great Lakes. La Salle's party of explorers and ship carpenters were the first Europeans clearly documented to have explored the Niagara River and view its cataract. During the winter of 1678-79, they set about their work under the eyes of the still-suspicious Iroquois. La Salle's vessel, Griffon, was launched in the spring of 1679. Early in 1679, La Salle established a small post on the Fort Niagara site to support his shipbuilding project. He found there a high bluff, largely cleared of trees, which offered a good location for a fortified storehouse. The stockade, dubbed Fort Conti, was well-situated to maintain communications with his base at Fort Frontenac on the eastern end of Lake Ontario. Fort Conti provided a place to store supplies for the men working above the falls. Sometime after La Salle had departed in his vessel, however, little Fort Conti accidentally burned and the site was abandoned. The post had existed for less than one year, but it represented the first challenge to the Iroquois barrier. The thaw in relations between the French and the Iroquois soon ended. In 1687 the Governor of New France, Jacques-Rene de Brisay, Marquis de Denonville, planned a military expedition to remove the Iroquois threat to his colony. The French were also alarmed by growing British interest and influence in the Iroquois country. Britain's acquisition of the Dutch colony of New Amsterdam in 1664 had placed an aggressive European rival within reach of the Great Lakes via the Hudson-Mohawk-Oneida Lake route to Lake Ontario. Denonville, at the head of a formidable army, moved against the Seneca, westernmost of the five Iroquois nations. He attacked their villages along the Genesee River, south of modern Rochester, without decisive success. 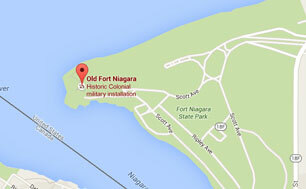 His force then moved west to the Niagara River to establish a fort. Late in July 1687, the troops erected a stockade which was named for Denonville. The governor then withdrew to Montreal leaving Captain Pierre de Troyes and a garrison of one hundred men at the new post. The Iroquois were far from cowed by Denonville's attack, and the fort at Niagara was an unwelcome enemy presence on their land. Seneca warriors hovered near the post, combining with the harsh climate to isolate the garrison. Fort Denonville had been intended to control the Seneca, secure the portage and deny Niagara to the British. It became instead a trap for its garrison. Disease and starvation soon took their tolls. By the time Lake Ontario again became navigable in the spring of 1688, only twelve of the garrison remained alive. Burials discovered inside Fort Niagara in 1929 were possibly the remains of De Troyes' unfortunate soldiers. In spite of this disaster, a new garrison was assigned to Fort Denonville. The post was only occupied until September 1688, however, and then abandoned. Isolation and the Iroquois had rendered it untenable and had defeated French efforts to establish themselves at Niagara. The Iroquois barrier to the Great Lakes was shaken but unbroken. In periods of peace, travelers crossed the portage, but it was not firmly under French control. More than three decades would pass before the French were able to reestablish themselves at Niagara. The years between the abandonment of Fort Denonville and the construction of Fort Niagara witnessed many changes in North America. The French expanded their influence in the Great Lakes, concentrating on native tribes beyond Iroquois control. A settlement at Detroit in 1701 barred the British from Lake Huron and its rich fur trade. Another post was established at Michilimackinac in 1715 as the French consolidated their hold on the Upper Lakes. The North American rivalry between Britain and France grew more intense as their relations deteriorated in Europe. New York Governor Thomas Dongan's vehement protests against Denonville's 1687 incursion into the Iroquois country presaged open conflict. France and Britain soon clashed in a pair of European Wars with their colonies involved in corresponding conflicts known in America as King William's War (1689-97) and Queen Anne's War (1702-13). Both European nations continued to view Niagara as a place of importance for ensuring access to the Great Lakes and its fur trade. French efforts to influence the Iroquois intensified, especially after 1701 by which time the Five Nations had been weakened by nearly a century of conflict. They sought a neutral position in the Anglo-French rivalry. French agents and traders, notably Louis-Thomas Chabert de Joncaire, encouraged a more benign posture by the Iroquois. By the second decade of the eighteenth century, the climate was right for the French to reestablish themselves at Niagara. In 1720 the Seneca gave Joncaire permission to construct a trading post. He chose a location at the foot of the Niagara Escarpment, the northern terminus of the portage. The site is within Artpark in Lewiston, New York. From there Joncaire and his fellow traders could extend their influence among the westernmost of the Iroquois nations. The French required a more substantial fortification to ensure their position at Niagara. Joncaire reported that the Seneca would allow a new post, as long as it was not a masonry fort. In 1725 the French met with a delegation of Iroquois at Onondaga, the central town of the Five Nations, to request permission to construct a new trading house of stone. 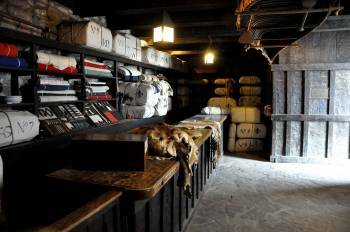 The French emphasized their peaceful intent by carefully terming this "a House of Peace" and representing it chiefly as a place to exchange goods for furs. Although few Seneca were present at the council, the representatives of the Five Nations gave their permission. Belated protests by the Seneca did not prevent the French from moving ahead with their project. The post at Niagara was intended for much more than trading. Gaspard-Joseph Chaussegros de Lery, the chief engineer of New France, designed a "machicolated house" as its central feature. This was to be enclosed by a wooden stockade, a defense common to most North American trading posts. DeLery 's fort thus avoided the appearance of a "regular" fortification. The house, however, was designed to be impregnable to native attack. It included all the facilities necessary for a garrison - quarters, storerooms, a well, and even a chapel. DeLery's "house" survives today, known by its more romantic name, first used in the nineteenth century - the "French Castle." Construction of the new fort began in 1726 and was completed the following year. To better counter the British, it was situated at the mouth of the river on the site of Denonville's fort. By the end of 1727, the French were firmly established in a strong frontier fortification manned by about thirty soldiers. The Seneca were unhappy but resigned to the French presence while the British protested in vain that Fort Niagara violated the 1713 Treaty of Utrecht. A fort built at Oswego by the British in 1727 did little but secure their access to Lake Ontario. The French had taken possession of the ports to the West. For the next thirty years, British traders would conduct considerable business on the south shore of Lake Ontario, but those who reached the rich Ohio Valley did so by a slow, tortuous journey over the mountain trails of Pennsylvania and Virginia. Fort Niagara was useful only briefly as a trading post. It soon became more important as a guardian of the portage. As the fur trade moved inevitably westward, the number of pelts passing through Niagara increased. Control of this traffic was important to the French. In 1751 they established a secondary post, Fort Little Niagara, at the head of the portage above Niagara Falls to prevent western Indians from slipping past Fort Niagara to trade with the British at Oswego. The need to protect the portage increased the military role of Fort Niagara. The demands of a third colonial conflict, King George's War (1744-48), caused the post to be strengthened and enlarged. It was also during this conflict that Fort Niagara first served as a base for Indian raids against the frontiers of the British colonies. Tension between the two colonial powers did not abate with the end of King George's War. On the contrary, rivalry over the West, particularly the Ohio Valley, increased. Niagara provided the French with their main avenue to the disputed territory south of Lake Erie and guarded communications between the colonies of New France and Louisiana. Beginning in 1749, Fort Niagara became the staging point for military expeditions to the Ohio Valley. The most aggressive of these occurred in 1753 and 1754 when French troops established a chain of forts between Lake Erie and the forks of the Ohio River, the site of modern Pittsburgh. 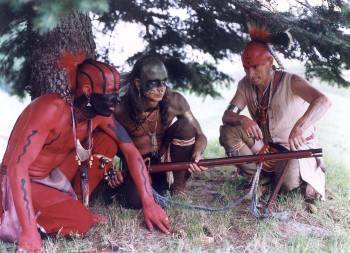 This confrontation with the British sparked the French and Indian War (1754-60). The climactic North American conflict between France and Britain differed from earlier colonial wars in that regular European troops were used by both combatants. Fort Niagara was totally unprepared to resist an attack by such forces. The machicolated house and its rickety stockade, by this time crowded with additional wooden buildings, provided adequate defense against Native Americans. British troops, however, would bring cannon which could quickly bombard the post into submission. The British were aware of the weak state of Niagara's defenses. During the summer of 1755, General William Shirley assembled an army at Oswego to attack Niagara and pinch off French communication with the West. Shirley could easily have taken the post, but he delayed too long. By September the British had lost the opportunity to besiege distant Niagara. Shirley's threat prompted an immediate response by the French. 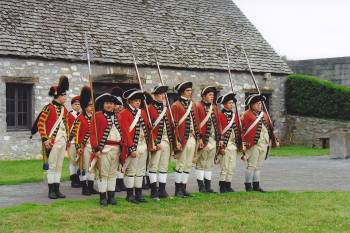 A battalion of regular soldiers, newly arrived from France, was sent to Fort Niagara in the autumn of 1755. The troops were accompanied by Captain Pierre Pouchot with orders to design fortifications capable of resisting artillery. Pouchot spent the winter of 1755-56 directing the construction of massive earthworks. His new defenses increased the size of Fort Niagara roughly eight-fold and have shaped its appearance ever since. 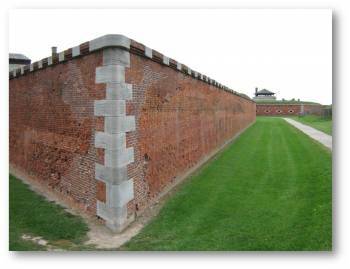 As soon as the new walls were completed, the old stockade was removed, and additional buildings were erected within the enlarged fort. For the first four years of the French and Indian war, Fort Niagara served as a base for raids by Native American warriors and French partisans against the British frontiers, particularly those of Pennsylvania. Niagara continued to protect communications between Montreal and the Ohio and Louisiana. French success required an unimpeded flow of goods and supplies to her soldiers and Indian allies. The British realized this and knew that the capture of Niagara would isolate the defenders of the Ohio Valley. The early years of the war saw many reverses for the British, however, and it was not until 1759 that they were able to organize another expedition against Niagara. The support of the Iroquois (by now comprised of six nations) was a critical factor in this undertaking. Although the Confederacy had remained neutral, the Iroquois attitude was changing by late 1758. The persuasiveness of Sir William Johnson, the weak position of the French and the long-standing resentment of the Fort at Niagara convinced most of the Iroquois to actively assist the British. 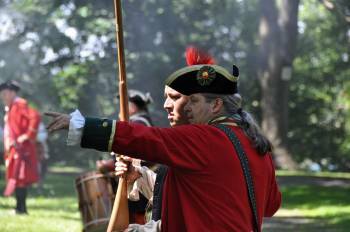 In May 1759 a British army set out from Albany under the command of Brigadier John Prideaux. Its goal was Fort Niagara. Prideaux left part of his force at Oswego to construct a replacement for the fort destroyed by the French in 1756 and to guard his vulnerable supply line to the Mohawk Valley. Then, on July 1, he led the balance of his army, about 2,400 soldiers and 1,000 Iroquois warriors, against the fortress of Niagara. Avoiding French naval vessels, the British landed four miles east of the fort on July 6. They quickly surrounded the post, held by Captain Pouchot with a garrison of six hundred men. Pouchot's strong, regular fortifications forced the British to conduct a European-style siege. The attackers were delayed for nineteen days as they dug trenches toward the walls. Batteries of cannon and mortars bombarded Fort Niagara day and night. By July 24 the British were within eighty yards of the walls, the Fort's Lake Bastion had been ruined and the defenders were exhausted. Their last hope was an army of 1,500 men from the Ohio country which had been summoned to the aide of Fort Niagara. Pouchot held on in hope that they could raise the siege. On July 24, however, the relief force encountered the British a mile south of the fort. The French were routed in the ensuing action, known as the battle of La Belle Famille. On July 25, 1759, Captain Pouchot surrendered Fort Niagara. The capture of Fort Niagara severed French communications with the West. The first winter was a difficult one for the new British garrison, however. French troops and their native allies still held Detroit and the other western posts and guarded the St. Lawrence River to the east. The only contact with friendly forces was by a tenuous route along Lake Ontario to Oswego and thence down the Mohawk River to Albany. To make matters worse, the British garrison was ravaged by a terrible epidemic of scurvy. 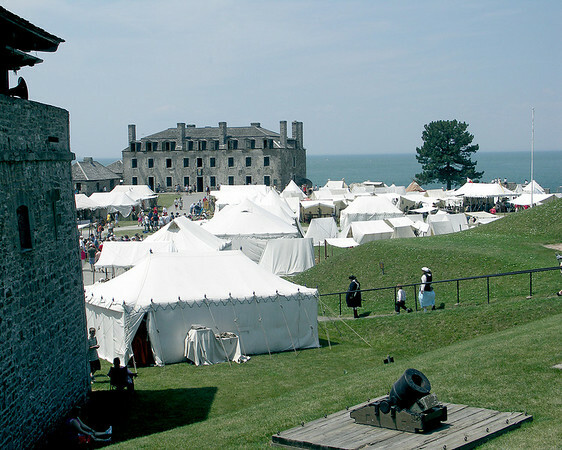 The capitulation of New France in September 1760 ended Fort Niagara's isolation. The British immediately turned their attention to the West. Expeditions left Niagara in 1760 and 1761 to occupy posts scattered as far west as Wisconsin. Fort Niagara became a meeting place between the British and Native American nations of the Great Lakes. In 1761 Sir William Johnson held councils at Niagara with many tribes, former allies of the French, in an effort to cement the new relationship. The post also provided a point of contact between the British and Native Americans of the Lower Great Lakes, particularly the powerful Seneca of Western New York and the Mississauga who lived in what is today southern Ontario. Fort Niagara thus retained its usefulness to frontier diplomacy. Niagara immediately became the guardian of Britain's communications with West and provided a convenient storehouse for military supplies and trade goods consigned to the other Great Lakes forts. British merchants established commercial warehouses in the shadow of Niagara's fortifications. The army improved the portage and new stockade was erected above Niagara Falls in 1760 to replace Fort Little Niagara which had been burned by its French garrison in 1759. Little Niagara was renamed Fort Schlosser in 1763. Another outpost was built at the Lower Landing (modern Lewiston, NY). These posts facilitated the movement of goods bound for Detroit, Michilimackinac and other western outposts. While British soldiers and traders quickly displaced their French predecessors, the Native Americans proved difficult to pacify. The Great Lakes tribes accepted British victory and waited. They soon found themselves badly treated by both the army and the traders. Rebellion erupted in 1763 in a conflict commonly known as the "Pontiac Uprising". Fort Niagara was not at first affected by the rebellion as the Native Americans' fury fell on the western forts. Eight of the tiny posts were captured by early summer. Only Detroit and Fort Pitt (Pittsburgh) were able to resist. Fort Niagara, the guardian of the communication between Detroit and British colonies, was crucial for supplying the beleaguered post. It was also the place where British forces gathered for a counterattack. While the safety of the Niagara Portage was particularly important, few troops were available to protect it. The vulnerability of this communication was made terribly evident on September 14, 1763. As a number of empty wagons were returning to the Lower Landing from Fort Schlosser, they neared the spot on the rim of the Niagara Gorge known as "the Devil's Hole." Suddenly, the convoy was attacked by a large body of Seneca warriors. The drivers, guards and draft animals were killed. Wagons and harness were thrown into the gorge in a clever attempt to disrupt supplies. Gunfire from the Seneca attack was heard at the Lower Landing, about two miles away, where two companies of the 80th Regiment of Foot were encamped. The soldiers rushed to the aid of the wagons but fell into an ambush which cost eighty British lives. Although Fort Niagara was not directly threatened, the disaster combined with autumn weather to prevent the suppression of the uprising during 1763. Winter found the rebellious tribes unsubdued. During the winter, the British laid plans to crush the rebellion. Fort Niagara would be the staging point for a new expedition to be led by Colonel John Bradstreet. Throughout the spring and summer of 1764, British and provincial regiments gathered at Niagara. The troops improved the defenses of the portage by building redoubts along the road from the Lower Landing to Fort Schlosser. A new post, named Fort Erie, was established on the shore of its namesake. Once this work had been completed, early in August, Bradstreet led his expedition across Lake Erie, relieved Detroit and held councils with the Indians. By the end of 1764, British troops were again in control of most of the Great Lakes posts. Fort Niagara played a further role in quelling the Pontiac Uprising. As Bradstreet prepared to advance to Detroit, Niagara hosted a huge council between Sir William Johnson and the Great Lakes Indians. Johnson obtained promises of peace and good behavior from most of the tribes. From the Seneca, however, he also exacted territorial concessions. As punishment for their role in the Devil's Hole ambush, they were forced to cede a one-mile-wide strip of land the length of the east side of the Niagara River. Johnson thus secured Britain's route to the heart of America. By 1765 the Great Lakes were once again peacefully under British control. Although memories of the uprising would linger and influence future dealings with the Indians, British policies became more sensitive to their needs. Greater attention was paid to keeping the tribes contented, and traders were further regulated in an effort to prevent abuses. Fort Niagara assumed an important role in both tasks. Soldiers of the garrison often served as policemen, and officers met daily with the many Indians who visited the post. Fort Niagara became quiet frontier garrison. A treaty of peace between Britain and France in 1763 ended their worldwide hostilities and any threat to Fort Niagara from a European army. The number of troops on the Great Lakes was accordingly reduced, and Fort Niagara was seldom occupied by more than 150 men during the later 1760s. The troops guarded the portage, moved supplies and policed the traders. Although Fort Niagara held the largest garrison on the Great Lakes, it still lacked the manpower to properly maintain rambling fortifications designed for a garrison of six hundred to one thousand soldiers. The earthworks were difficult to preserve and, with the end of any threat from the French, they were allowed to crumble. The defenses were bolstered in 1768 by a stockade around the "Castle" to provide a citadel against Indian attack. Occasional repairs were made to the fort, but the construction of two stone redoubts in 1770-71 was the only major addition of this period. Even these substantial buildings were intended to do little more than repel a determined Native American assault. The eve of the American Revolution found Fort Niagara again incapable of resisting a regular military attack. The fortifications, once so strong, were little more than grass-covered mounds outlined by sagging wooden pickets. 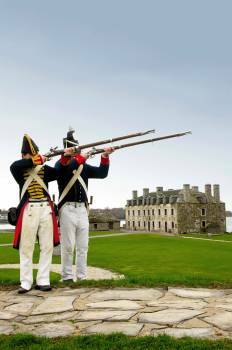 When the outbreak of hostilities found British forces in Canada in the position of their former French rivals, it became clear that Fort Niagara would have to be re-fortified. During the next eight years, the British would expend much effort and expense to protect their link with the West. 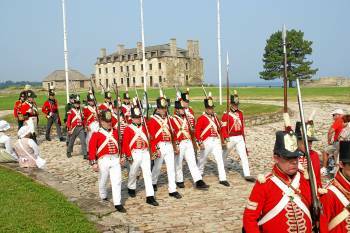 The war began badly for Fort Niagara's garrison. American forces invaded Canada during 1775, captured Montreal and cut off the Great Lakes posts. Niagara's isolation was not ended until the summer of 1776 when the Americans were expelled from Canada. From the outbreak of the war, however, Fort Niagara served as the chief contact point with the Iroquois and Native nations of the Upper Lakes as British representatives sought to persuade them to take up arms against American frontier settlers. Niagara's position made it Britain's most important post for marshaling the support of the Six Nations. Protection of the portage for military and commercial purposes remained the chief duty of the Niagara garrison. The Canadian fur trade continued, despite the inconveniences of war, and the traders, although restricted in their activities, maintained a steady traffic across the portage. Not surprisingly, they were highly vocal in their advocacy of a strong defense of the Great Lakes. 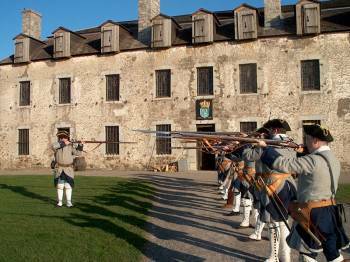 Fort Niagara also assumed important new roles during the American Revolution. It became a haven for loyalists fleeing from the frontier settlements of New York and Pennsylvania By 1777, able-bodied male refugees were being recruited into Loyalist military units. A corps of rangers was formed at Niagara under the leadership of John Butler during the winter of 1777-78. 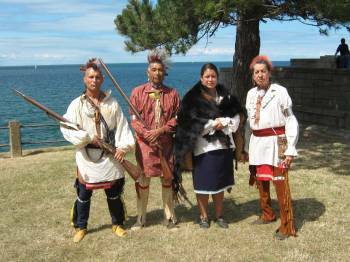 "Butler's Ranger's", accompanied by Iroquois warriors and a few regular troops from Fort Niagara, was soon raiding their former neighbors, a practice with overtones of civil war. So devastating were the raids from Fort Niagara, particularly those in 1778 against the Wyoming Valley of Pennsylvania and Cherry Valley, New York, that the United States government took military action. The farms of New York and Pennsylvania were threatened, and, since they produced food essential for American armies, drastic steps were deemed necessary. In 1779 George Washington dispatched an army under General John Sullivan to chastise the Iroquois. Sullivan's troops brushed aside feeble resistance and marched through the Iroquois country that summer, burning crops and villages. The Americans halted at the Genesee River, only eighty miles from Fort Niagara. Sullivan might have attacked the British post, but fall was approaching, and he lacked the provisions and artillery needed to conduct a siege. The Americans retired to Pennsylvania. The Iroquois incurred few battle casualties during Sullivan's destructive march. Many villages and crops were destroyed, however, and the Six Nations faced starvation during the winter of 1779-80. They flocked to Fort Niagara for supplies, aggravating an already serious shortage of provisions. The British tried to feed the Indians who camped before the walls or to disperse as many as possible to undamaged villages where food could be obtained, but many starved during the winter. The Iroquois were not forced out of the war, however, and their attacks continued with greater ferocity. The population displacement caused by Sullivan's campaign dramatically increased the number of Iroquois living near the Niagara River, and several new villages, including one near the modern Tuscarora Reserve in Lewiston, were established during the later years of the American Revolution. Sullivan's expedition marked the closest approach of United States troops to Fort Niagara during the War for Independence. This threat stimulated much labor on the fortifications. The earthworks were repaired and strengthened to resist an assault. The final years of the American Revolution saw continued raiding from Fort Niagara, and the garrison also supported campaigns being waged in the West. Troops from Fort Niagara were called upon to respond to American threats from both New York and the Ohio Valley. Their efforts helped keep the Great Lakes under British control throughout the conflict. The Treaty of Paris ended hostilities in 1783. Despite their soldiers' successful defense of the Great Lakes, however, British negotiators relinquished a large part of the region when they agreed to a boundary line between the United States and Canada which essentially followed the modern border. Fort Niagara fell within United States territory. British officers, Loyalists, the Indian raiders, and, most of all, the Iroquois were aghast. British troops did not immediately withdraw from Fort Niagara. By the fall of 1784 disputes had arisen between the two powers over the fulfillment of treaty obligations. The British decided to retain the Great Lakes posts including Carleton Island, Oswego, Niagara, Detroit, and Michilimackinac. This "holdover" period would last another twelve years. This decision allowed the British to securely hold the Niagara while settlements of refugee Loyalists were established on the west bank of the river. Their farms and villages were soon flourishing while the American side remained an undeveloped wilderness. Many people of the Six Nations also opted to leave their ancestral home in New York and resettle on Canadian lands offered by the British. Fort Niagara was maintained, although its commandants realized that the post would be ceded to the United States. Resolution of the dispute over the Great Lakes forts finally came in the early 1790s after Britain became involved in war with revolutionary France. The time was ripe for re-negotiation of the status of these valuable posts. The resulting Jay Treaty of 1794 stipulated that the British were indeed to give up the forts. United States troops peacefully received them from their British garrisons during the summer of 1796. Fort Niagara was occupied on August 10. The British retired to the west side of the river and began construction of a new post, Fort George, which would be completed by 1799. The role of Fort Niagara changed significantly when the first United States troops marched through its gates. While still an important guard post for the American side of the Niagara Portage, it had also become a border fortification. In the event of renewed hostilities between the United States and Britain, Fort Niagara would immediately be on the front lines. The American occupation of Fort Niagara signaled the beginning of settlement along the New York side of the river. Villages were established at Youngstown, Lewiston, Niagara Falls, Black Rock, and Buffalo in the decade after 1800. The safety of their inhabitants became an additional concern for the garrison of Fort Niagara. Troops also assisted with public works projects. Military Road (New York Route 265) was constructed by fatigue parties from Fort Niagara in 1802-05. Although it was intended to enhance the defense of the Niagara Frontier, such improvements also aided commercial development. 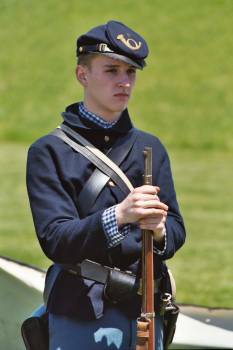 Despite the many responsibilities of the United States soldiers stationed in Fort Niagara, their numbers were always inadequate. Fortifications designed for nearly one thousand men were guarded by less than one hundred. The United States Army was thin, and few troops could be spared for any one post. The garrison soon found themselves hard-pressed just to maintain aging buildings and walls. The inevitable deterioration of Fort Niagara came at an inopportune time. Relations between Britain and the United States were often tense in the decade before the War of 1812. Several incidents led to war scares, and the inhabitants of both sides of the Niagara often felt threatened by their neighbors across the river. Despite the volatile international climate, however, relations remained surprisingly cordial between the Fort Niagara's garrison and their British counterparts in Fort George. Open conflict between the United States and Great Britain came in 1812. Congress declared war in June, and the Fort Niagara garrison found itself facing hostile troops situated only twelve hundred yards away. The post was woefully unprepared. Fortunately, so was Fort George. Both sides spent the summer of 1812 gathering their forces. On October 13, 1812, United States troops crossed the Niagara River and invaded Canada at the village of Queenston. The Americans were defeated in the Battle of Queenston Heights, although the British lost their capable leader, General Isaac Brock. During this hard-fought battle, Fort Niagara and Fort George exchanged furious artillery fire. An equally violent but indecisive exchange between the forts occurred on November 21. Fort George's slight advantage in elevation caused grave difficulties for the artillerymen in Fort Niagara. In an effort to increase the effectiveness of their fire, American troops removed the roof of the "castle" and the two stone redoubts and mounted cannon atop the three buildings. Both sides also erected batteries along the river banks. The November bombardment spawned an American heroine, Betsy Doyle, who carried hot shot to artillery located on the Castle roof. Fort Niagara's commandant, Colonel George McFeely compared Mrs. Doyle's actions to those of Joan of Arc. Aside from the bombardments of October 13 and November 21, however, the frontier remained quiet until the spring of 1813. In May, after successfully capturing York (Toronto) an American fleet brought an army to the mouth of the Niagara River. A bombardment from Fort Niagara and the batteries along the river shattered Fort George on May 25. Two days later, United States troops landed on the Canadian shore. The British were forced to abandon Fort George after a fiercely contested battle and retreated westward along Lake Ontario toward Burlington Bay. The capture of Fort George was the last success for this army. Although they controlled the mouth of the Niagara River, United States troops soon met defeat in battles at Stoney Creek and Beaver Dams and spent the rest of the summer bottled up in Fort George. By autumn, the United States army on the Niagara had been greatly reduced by losses, transfers, and expiration of militia enlistments. By December the American commander, militia General George McClure, had decided to abandon Fort George and retire to the United States. McClure then gave an unfortunate order. He instructed his troops to destroy both Fort George and the village of Newark (Niagara-on-the-Lake, Ontario) to deny shelter to the British. 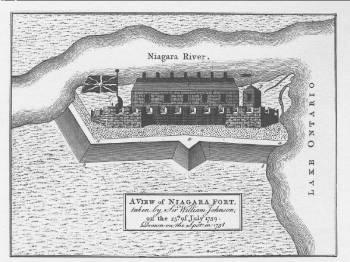 With the town in flames, the Americans withdrew to Fort Niagara. The British wasted no time reoccupying the ruins of Fort George and planning an assault on Fort Niagara. More than five hundred soldiers crossed the Niagara River to Five Mile Meadows on the night of December 19, 1813 and silently turned north toward Youngstown. American pickets stationed in the village were taken by surprise, and the attackers obtained the garrison password. A short march carried them to Fort Niagara where they burst through a partially open gate and caught the garrison unprepared. With Fort Niagara secured, the British and their Indian allies marched back upriver, destroying farms and villages on the New York side as far as Manchester (modern Niagara Falls). A second British raid at the end of December burned Buffalo and completed the devastation of the Niagara Frontier. Only the buildings of Fort Niagara were left intact to shelter a British garrison. Military action centered chiefly on the Upper Niagara River during the campaign of 1814. United States forces, although successful in the field, were unable to besiege Fort Niagara. Anticipating a siege, the British strengthened the deteriorated fortifications. The old post was important to their efforts to deny the mouth of the Niagara River to the United States naval forces and tie down additional troops. The occupation of American territory also provided political leverage in peace negotiations. The War of 1812 was ended by the Treaty of Ghent, signed on Christmas Eve 1814. The settlement stipulated that captured territory be returned to the status quo ante bellum. Fort Niagara once again passed to the United States by treaty, and American troops reoccupied it on May 22, 1815. United States engineers soon made recommendations for improving the defenses. By January 1816 plans had been prepared for constructing a seawall and rebuilding the fortifications with the goal of securing them against artillery fire from the Canadian shore. Only a small part of the proposed work was executed, however, due to the cost and improved relations with Great Britain after 1817. 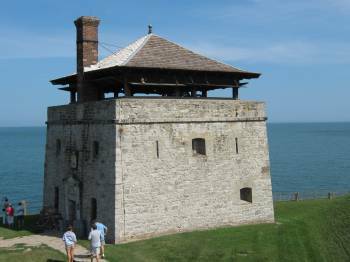 By the early 1820s, Fort Niagara was once again a decrepit and poorly guarded border post. 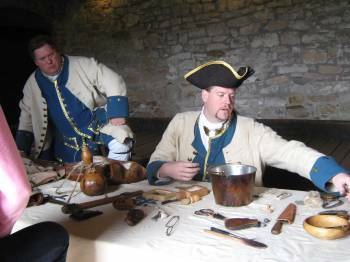 History of a different sort was soon being made at Fort Niagara. A new post surgeon, Dr. William Beaumont, arrived in May 1825 accompanied by a young patient named Alexis St. Martin. Three years earlier, St. Martin had been seriously wounded by a close-range shotgun blast to his abdomen. The young man survived this terrible wound, but his side never properly healed. Beaumont found himself with an opportunity to observe the workings of a living human stomach. St. Martin eventually agreed to submit to experiments, and the first published series of investigations was completed at Fort Niagara during August 1825. Surgeon Beaumont later published more sophisticated observations and is remembered today as the first physician to accurately explain the workings of the human digestive system. The second event of 1825 had a much greater impact on the future of Fort Niagara. Completion, in that year, of the Erie Canal permitted horse-drawn barges to travel swiftly from Albany to Buffalo. The Niagara Portage suddenly lost much of its importance, and with it much of the strategic value of Fort Niagara. The Erie Canal so changed the defense needs of Western New York that the garrison was withdrawn from Fort Niagara in 1826. Only a caretaker guarded the walls for the next two years. The final blow to the portage came three years later when the first Welland Canal allowed small sailing vessels to pass between Lakes Ontario and Erie. One of the most bizarre incidents in New York history occurred at Fort Niagara during its 1826-28 deactivation. William Morgan, a resident of Batavia, had joined the Masonic Order. He soon became disillusioned, however, and published a booklet exposing the "secrets" of Freemasonry. The Masons of Western New York considered Morgan a renegade, and radical members resolved to silence him. 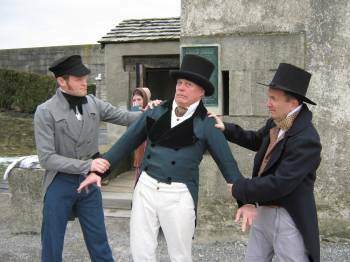 In the fall of 1826, they kidnapped Morgan, carried him to the Niagara Frontier and eventually confined their prisoner in Fort Niagara's powder magazine. The vacant fort's caretaker was a Mason, so Morgan was effectively isolated. What occurred next is a mystery. William Morgan disappeared from Fort Niagara's magazine and was never seen again. Anti-Masons claimed that Morgan had been murdered. Masons insist that he had left the country and settled in Canada. Neither version of his fate has ever been confirmed, but the Morgan affair stimulated a tremendous anti-Masonic backlash throughout New York and the rest of the United States. Despite its diminished strategic value, troops reoccupied Fort Niagara in 1828. They saw only routine duty until most were sent westward to fight against the Indians of Wisconsin in the Black Hawk War of 1832. Two years later, Fort Niagara was deactivated a second time and not reoccupied until 1838 in response to a new crisis on the northern border. Disaffected Canadians had risen in rebellion against their government in 1837, and the rebels sought arms and shelter in the United States. Anglo-American relations quickly deteriorated. Fort Niagara was in no condition to resist attack should war actually come. Heightened tensions caused American authorities to reexamine the defenses along the Canadian border. Recommendations made in 1838 caused Congress to authorize repairs and improvements to Fort Niagara. Work commenced in 1839. The land defenses were rebuilt, the 1816 seawall was completed, a masonry wall and shot furnace were constructed along the river side, and repairs were made to several buildings. By 1843, Fort Niagara was once again defensible. The border tensions of 1837-38 had subsided by the time renovations were completed. War with Mexico in 1846 again diverted the United States military resources, and the Fort Niagara garrison was withdrawn a third time. Troops returned at the conclusion of the conflict in 1848, only to depart once again in 1854. The decreased importance of the United States Army to the western frontier dictated such sporadic occupation of Fort Niagara. During its vacant periods in the 1840s and 1850s, the post was guarded by a lone ordnance sergeant, Lewis Leffman. Although Fort Niagara was unoccupied at the outbreak of the Civil War, tensions between Great Britain and the United States caused a garrison to be sent there late in 1861. British intervention on the side of the Confederacy was feared by the United States and would have inevitably led to fighting along the Canadian border. Following an 1861 Anglo-American diplomatic incident known as the "Trent Affair", Britain sent large numbers of troops to North America. Because of these potential threats, Niagara's fortifications were again inspected with an eye toward modernization. Construction of new concrete and brick revetments and artillery casements along the land front began in 1863. Relations with Britain had improved by the time the work had advanced very far, and Fort Niagara's garrison was sent to the front in 1863, but the fortifications had been carried to completion by the end of the decade. The artillery casemates were never armed, however, and the new defenses were obsolete by the time of their completion. Fort Niagara was again garrisoned late in 1865. Troops would thereafter occupy the post almost continuously for the next ninety-eight years. One justification for the return of soldiers to Fort Niagara was a new source of border tension, the Fenian Brotherhood. This organization was devoted to the liberation of Ireland, by military means if necessary. Many of its members were Civil War veterans, so the Fenians had an experienced and willing pool of soldiers. Their plans included the conquest of Canada as a stroke against Britain. Activity along the Niagara Frontier reached its peak in June 1866 when a Fenian army crossed into Canada from Buffalo. The Fenians occupied the village of Fort Erie and defeated Canadian militia at Ridgeway, Ontario but were forced to withdraw to New York. Although United States authorities intervened to prevent further incursions, border tensions persisted into the early 1870s. The post-Civil War years witnessed a significant change in Fort Niagara. The garrison that arrived in 1865 found the fort's living quarters antiquated and virtually uninhabitable. Construction soon began on modern buildings situated outside the old fortifications. This was the beginning of "New" Fort Niagara which occupied the military reserve, the area that is today Fort Niagara State Park. The new complex was soon the most important component of the post. By the mid-1880s, nearly all officers' and soldiers' quarters were in the "New" Fort and the buildings in the Old Fort were used primarily for storage or as housing for military families and civilian employees. A few such people resided in the French Castle as late as 1915. As Fort Niagara expanded beyond the walls, its function changed again. It was still a border garrison and also served as a prison for military convicts during the 1870s. When a one thousand-yard rifle range was completed in 1885, Fort Niagara became increasingly useful for training United States soldiers. Troops were prepared for the Spanish-American War of 1898 and the Philippine Insurrection of 1899-1901. The post also served as an officers' training camp during World War I. 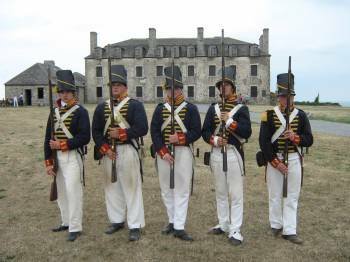 Between these conflicts, Fort Niagara continued its familiar role as barracks for battalion of infantry. Despite all the activity in the New Fort, Old Fort Niagara was in a sadly neglected state by the early 1920s. Lake Ontario had undermined the seawall protecting its northern flank, and the "French Castle" was in danger of collapse. The surviving eighteenth century buildings were badly deteriorated. Fortunately, the old fortifications and structures had long been recognized for their historical value. A group of local citizens, alarmed by the state of the historic area, began to advocate repair and preservation. They formally organized as the Old Fort Niagara Association in 1927 with the goal of saving the Castle. This was accomplished between 1926 and 1929 with Congressional appropriations matched by funds raised from the private sector by the Association. Further cooperation between the Army and the Association permitted restoration of the other structures by 1934. New Fort Niagara continued as an active post. The 1930s were the last years of the "Old Army", and the appearance of the New Fort was more like a park than an army base. 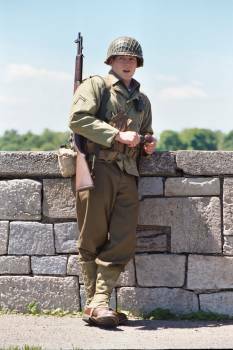 Dress parades, band concerts and close ties with the local populace were common, especially while Fort Niagara was occupied by the 28th Infantry Regiment (1920-1940). The Army maintained close ties with the Old Fort Niagara Association and often used the historic area for military and patriotic ceremonies. The days of the "Old Army" ended in 1940, and the 28th Infantry was transferred to South Carolina. Too small for a World War II training base, Fort Niagara became a "reception center" for recruits and served as such from 1941 until 1943. From 1944 until 1946 the reception center was reactivated as a camp for German and Austrian prisoners of war. Fort Niagara was declared surplus at the end 1945, and many of the buildings were converted to temporary housing for veterans. Plans to convert the New Fort to a park were developed in the late 1940s, but the Korean War intervened and Fort Niagara was reoccupied in 1950. Anti-aircraft troops were stationed there from 1952 until the last military units were withdrawn in 1963. Long-delayed plans to convert the area to a park were soon implemented, and most of the garrison buildings were demolished in 1965-66 to clear the area for recreational purposes. Only a few structures remain. With the exception of the United States Coast Guard station situated below Old Fort Niagara, the military history of this important site had come to an end.